1 Heat the oil in a pan and sweat the onion until translucent. Add the carrots, leek, diced red pepper and celery and sweat for 3 minutes. Add the mince and fry until browned. Remove from the heat and leave to cool. 2 Soak the bread roll in plenty of warm water then squeeze out well. Combine all the stuffing ingredients, reserving half the chopped herbs as a garnish. 3 Wash the peppers, cut off the top quarter to make a lid and carefully remove the stalk and seeds. 4 Grease a baking dish, place the peppers in the dish and fill with the stuffing. Put on the lids. 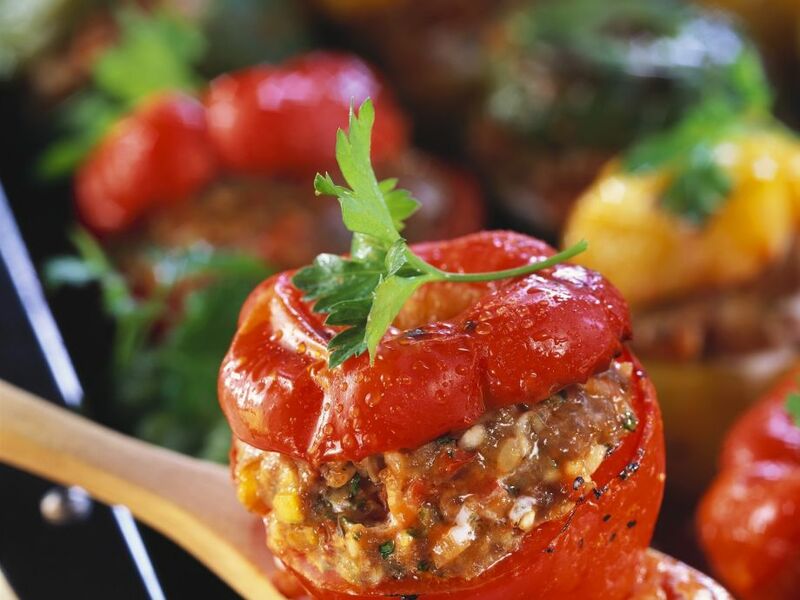 5 Bake the peppers for 20-25 minutes in an oven preheated to 200°C (180° fan) | 400F | gas 6. 6 For the tomato sauce, heat the oil in a pan and sweat the onion until translucent. Add sugar, salt, pepper and paprika to taste. 7 Add the vegetable stock and tomatoes and simmer for 5-10 minutes. Check the seasoning, then add the tomato sauce to the pepper dish for the remainder of the cooking time. 8 Serve garnished with the reserved herbs.